No branding, no washes, no embroidery, no ad campaigns and no celebrities; that’s the creed of The Unbranded Brand, an innovator in the premium denim scene. Made from stunning Japanese selvedge denim that wears perfectly to the customer, The Unbranded collection features classic Straight and Tapered fits, as well as the more contemporary Skinny and Tight silhouettes. While lacking adornment, the collection is finished with the highest quality hardware capable of withstanding continuous wear.Their jeans are simply stripped down to the core essentials: a great fit, solid construction, and top quality selvedge denim. Overall these are nice quality denim for the price. They are just a lot smaller than expected so returning for a larger size. Raw denim sizes are all over the place depending on brand so not a big deal. A few things to be aware of. The 1% spandex on this style (UB222) may as well not exist. The belt loops are oddly oversized in terms of space. The back rise is crazy low. I'm of slender build and have a small hind end, so low-rise usually works fine - but these are ridiculous. This pair went from the 1st wash into the Goodwill pile - the rise was a deal breaker. Unwearable. Go with the UB201 if you're looking for a classic taper from UB. It's heavier denim, cheaper, and comfortable. Good quality especially for the price. The rise could be a little longer but overall solid jeans. Quality: Jeans are made a quality raw denim, easily the best denim I own. I used the scale on the branded website to size and purchase and the waist is perfect. They are a true 36 length so I had them hemmed which was expected. I wear them with dress shirts and blazer for smart casual meetings at work. This was obviously worn! Not in new condition. Smelled like body odor. These jeans feel nice and the quality seems great. I ordered a size up and they fit well in the hip and thigh. The real issue I had with them was the leg. Definitely felt straight or relaxed, not slim as described. Very, very stiff denim, to the point that they were quite difficult to put on. 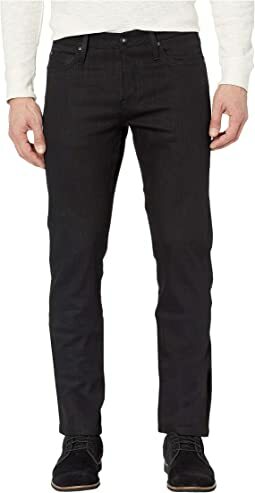 I suspect they will break in over time, however I found the combination of the skinny fit without any give to the material to be a bit too uncomfortable for my taste. These are a '10'. Great fit; shrink tight and become a second skin on your body. This is the first time I've purchased Unbranded Tight. They are stiff new. But when you break them in the right way - put them on and swim for 3 hours, they mold to you in a perfect shrink-fit. I am an avid and active swimmer and diver with lifeguard experience.These jean swim life a barracuda! Add a neoprene or rash guard top and you have the best dive skins available. Swim hard and dive deep! The way that these jeans are dyed, roped dyed, they will bleed indigo dye on everything for months. I wiped them down with paper towels when I first got them, wore them 20 times after that and they are still bleeding. According to Unbranded, this is normal. I can still rub them with paper towels and blue dye rubs off. You will also need to wash your hands every few hours as they will turn blue. They are very well made and comfortable but having blue dye rub off on everything is a deal breaker. Overall I like the pair of denim & of course the price. My one beef thus far with unbranded brand denim is the top button on their denim (i.e. the hardest button to button). I've owned several pairs now & on every pair trying to button the top button is like putting a 2x4 through a mason jar - pretty much impossible. Otherwise, a great pair of denim. Superb style. Obviously they are very stiff in the beginning but only a couple of weeks. Could not be of better quality at this price point. As these arrived in the mail, I was bemused that they were as stiff as a board. I have dealt with midweight raw denim before in the past but never heavyweight until today. True to their name, they are thick and warm for these frigid nights. Upon arrival, it was quite a chore to slip these 36" inseam jeans on given how stiff they were and how not tall I am. I was befuddled as to how these were labeled "skinny" yet had a straight leg through and through. I have since come to find out that they are indeed more straight cut than tapered. Which is all the more confusing given that they have a tapered line that has a larger leg opening than these. The Zappos leg opening numbers don't appear to be correct when comparing them to the brand's website. I would not call these "skinny". They are more akin to Levi's 513s. 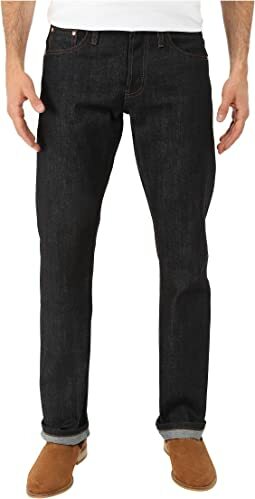 Compared to Levi's 510s, these have a leg opening of 15.2" versus 13.5" (converted Unbranded which they seem to be measuring the radius rather than diameter as Levi's does). Substantially bigger leg opening. 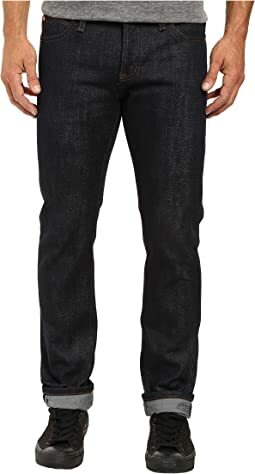 If you are looking for something closer to Levi's 510s skinny jeans go with the UB421 Tight Fit. With a 13.3" leg opening, they are more tapered. Please note these numbers are based on the 32 size. Overall, I am a bit bummed that these were not exactly what I was looking for but I will keep them. They will be great to see how these wear out. In the future, I would lean more towards the UB 4xx Tight Fit line for that true skinny, tapered leg. Other than that, these are going to fade greatly in the coming months. Excited to see how these compare to midweights. So far these are great selvedge jeans. It's gonna take awhile to fade these in I think. I wear a size 30 in Levi's so I ordered these in the same. It's a little tight but they will stretch out a bit over time. 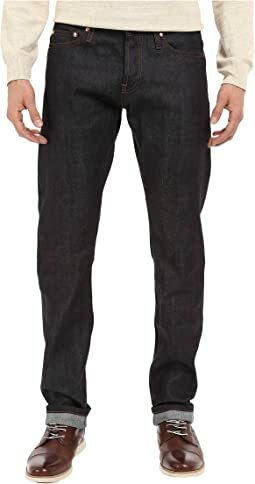 A great price for selvedge jeans. 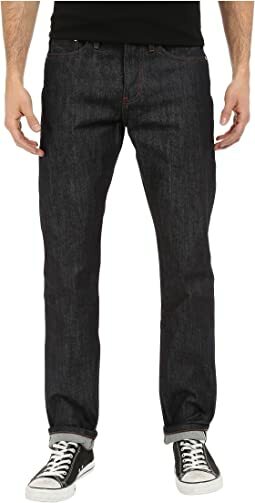 Cheapest (relative quality) selvedge denim on the market! In this instance, I think this is an excellent balanced value in terms of construction, quality of materials, and price. You cannot expect $300.00 quality for $82.00 USD! Tapered cut is excellent for folks with thicker thighs, however if your waist-to-thigh ratio is a squarer block, you'll find this is a bit restricting (look for Unbranded's newest cut, the "regular tapered"). This material seems a little less forgiving than the tapered 'denim' (this is more akin to a heavyweight selvedge chino material), and as such will generally stretch less over time. However, if you can find the right fit, this is an asset more than a detraction. Material is less likely to fade than regular denim, which would be a pro, or a con, depending on what you're looking for. Deep black color, blue ticker along the selvedge line, typical "Unbranded-branding", blacked-out hardware and patch (nice touch), quality garment. 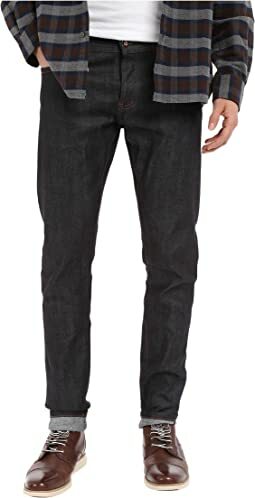 Nice looking pair of jeans for cheaper than most. One of the belt loops fell off after about 2 weeks so that's a bummer. 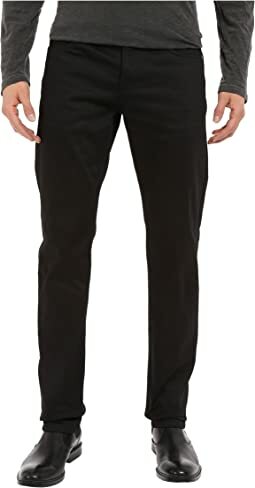 I wear a 35 in Uniqlo and went with a 34 in these which was crazy tight for the first few hours but ended up perfect. The fit is a little looser from the knee down than the Uniqlo slims. All in all I'm happy with the purchase, assuming I can fix the belt loop. Couldn't be happier. Love the fit. I am a size 31 and it fits like a glove. As far as the inseam goes it's not too long, just right. Breaking them in is a blast. 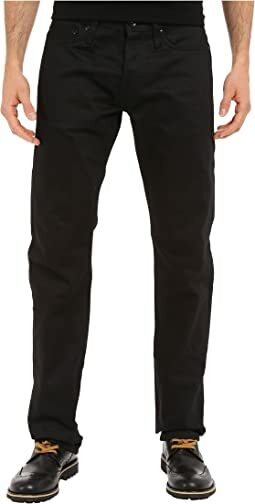 These jeans are awesome! Will buy another pair in due time. Very misleading description for the "skinny" fit. 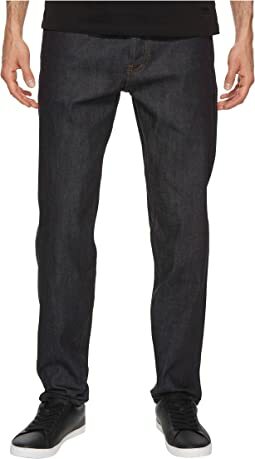 This skinny fit is actually more of a straight slim fit, literally a 514 for us Levi's fans. Overall the material seems durable and looks fun to break in but I'm discouraged by the misleading labels. Very happy with them. I've tried on Levis skinny jeans and they feel painted on compared to these which have a nice tapered fit. The material is substantial and have not machine-washed them so they have retained some of their stiffness. Had them for a year, worn mostly for dressier occasions and am now getting another pair. Good value. The jeans sizing seem to run about as described. I wear a 32" and tried both 32" and 33". The 33" could have worked albeit with a bit too much room. The 32" fit nicely without being overly snug. They are as of yet unwashed so I expect they'll snug up a bit, but there's sufficient room for that to happen. It's a heavier denim than most jeans, especially anything with elastane in it, and so isn't as forgiving a fabric. That is to be expected, and is an acceptable tradeoff. The major con is the pockets. It might be a function of being new, but the front pockets feel a bit tight to get in and out of. They're deep enough to get a phone into, but not deep enough for the phone to ride comfortably in the pocket when sitting or crouching. The rear pockets are mostly fine, they have some reinforcements around the top corners which restrict the width, meaning that some paper notebooks or devices won't fit in there. Given the other factors, and especially the general quality at this price point, the pocket are an issue I can live with. Great pair of pants. I was worried that they'd be too skinny but the thighs are relatively generous for this kind of cut. Pretty stiff out of the box but after a few days of wear, they're much softer. Only complaint is the way the waist is constructed - fits perfectly towards the thigh but the upper part shoots straight up instead of contouring to your hip. 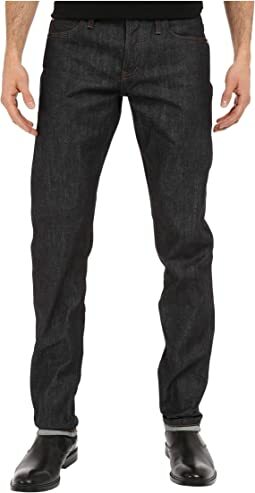 Overall a great piece of affordable selvedge. Same material and parent company as the more adventurous Naked and Famous but made in Macau instead of Canada.